Looking a bit like a commercial washing machine--and weighing nearly as much--this early model porthole has a true transformer power supply on a separate chassis for the huge transformer and two 5U4G rectifier tubes. So that the main chassis won't get jealous of the sub chassis' twin ST16 bottles, parallel 6BG6Gs are employed for horizontal sweep, accompanied by a 5V4G damper. Zenith introduced its TV set line with their circle screens in 1948. 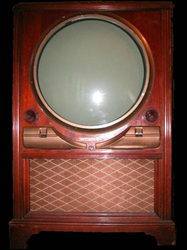 The success of the Zenith portholes was likely the main factor that led to an industry-wide change from rectangular masks to "wide" or "double-D" masks by Zenith's competitors in 1949. Note the blurb in the National Geographic ad at right about "up to 30% larger" pictures using the same tubes. 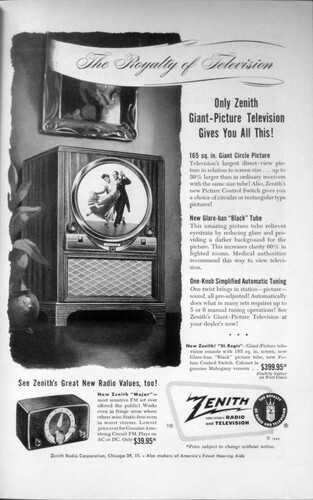 The first Zenith TV sets came from the factory adjusted so that the raster filled the screen. 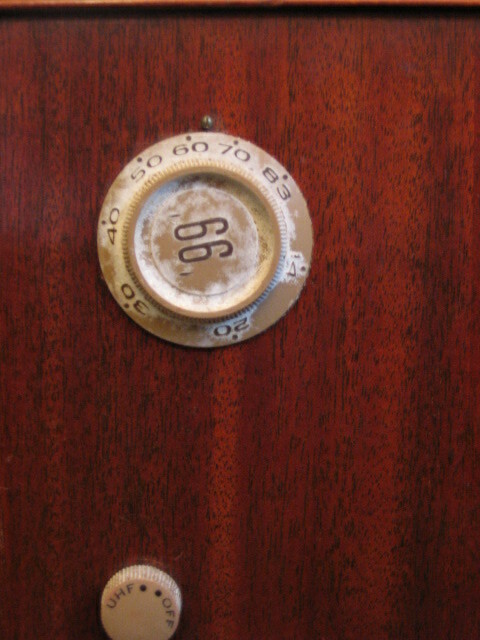 Apparently not everybody tolerated the resulting image distortion because sometime in 1949 the 'picture control' switch was added. That gave Zenith owners a choice between tall, skinny people on a full screen or a normal image with dark bars at the top and bottom. This particular example was modified sometime early on to receive UHF.